This year has already become one of the most successful years for Massachusetts-based biotech firms as the number of IPOs completed half way through 2018 has surpassed the total IPOs for 2017. The continued financial investment in the sector sees no near-term end, as Governor Baker promised further funding for growing biotech firms throughout Massachusetts at this year’s BIO Convention. As more biotech firms continue to get funding and grow, we see lab space becoming more valuable. As East Cambridge rental rates hover around $90/SF and vacancy around 1%, companies have had to look outside the Cambridge core, creating growing clusters of biotech firms in areas like Watertown and Lexington. We continue to keep an eye on how these suburban clusters will develop and we look to see if more will grow. Housing is one of hottest issues in Massachusetts. We are seeing an influx of government policies focused on housing being encouraged before the current legislative session ends. Overall, should policies promoting the addition of more housing be passed, it will increase the attractiveness of towns in and around Boston for both employees and businesses. One reform has particular focus on the suburbs – which we believe will help attract both businesses and employees out of the urban core, helping create the desired “live-work-play” developments that attract big-name companies to a certain area. be ignored as a disruptive force in the way companies look at office space. Additionally, the co-working trend is now disrupting retail and industrial space as companies offer short-term leases in real estate sectors previously untouched by co-working. We see this trend to continue to boom and potentially make its way to the more densely populated suburbs, as tenants pursue more flexible lease terms. Self-Driving cars have been OK’d for testing in Boston. The future of driverless cars is no longer a far off dream, but a potential reality within the next 1-3 years. Long term, we see self-driving cars causing massive disruption in the commercial real estate space – as parking lots become obsolete and employees are more open to longer commutes due to their ability to be more productive in the car. This approval for testing has been a large milestone for a hugely disruptive technology and we look forward to observing its upcoming impact. Medical marijuana has already had a massive impact on the industrial real estate market in Massachusetts. With the first recreational marijuana permit getting approved, the retail market now becomes another highly sought after real estate market for this soon-to-be booming industry. In the short term this will put a lot of pressure on local governments as they determine whether or not to allow the use in their zoning by-laws. Get ready for several towns to welcome the influx of business, while others refuse to budge. Prices are what we believe to be the peak of the market, but this has not slowed investors or owner-occupants’ desire to purchase quality assets (5 sales in Q1 and 10 sales in Q2). Rental rates are averaging around $37.50/SF for Class A properties and $29.50/SF for Class B space. Healthy and active market as evidenced by continued construction, low vacancy and positive absorption for the quarter. In Q4 2017 we noted concern about several spec buildings that were coming to market in Q1 2018. Since then, there has been strong activity in some spec properties. Most notably, ZoomInfo signed a full-building lease at Boston Properties’ 73,000 SF building at 170 Tracer Lane, Waltham, as well as Deciphera Pharmaceuticals signing for 44,000 SF at the POST development in Waltham. Rental rates are pushing some long standing tenants with expiring leases out of the Central 128 core. Industrial property demand continues to outpace the almost nonexistent supply. This continues to force companies to move further outside of Central 128 to find suitable industrial properties that fit their needs. Large blocks of space remain difficult to lease, despite multiple requirements floating around the market. Tepid demand for 20,000 plus SF blocks has led to more Landlord concessions to attract tenants such as free rent and generous improvement allowances. Tenants looking for the open ceiling “tech” look are now finding it in traditional office buildings at high cost to Landlords. ClearMotion has signed a lease to take 122,000 SF at 805 Middlesex Turnpike in Billerica, bringing new activity to an area left barren from Millipore’s relocation to Burlington. Two 100,000 plus SF Office users have recently renewed; Novanta for 150k in Bedford and Sonus Networks for 100k in Westford. Q2’s leasing activity was not as robust as that of Q1, with only nine new deals above 10,000 SF (13 in Q1) and only 4 new deals above 20,000 SF (9 in Q1). Despite the rising costs of construction there is little demand for vacant office property to purchase across most of the market, with average sale prices in the mid $40’s/SF for vacant buildings. The Industrial market in Q2 continues to heat up with the warm weather extending the current strength in activity and demand for both leasing and purchase of distribution and service centers. Marijuana cultivation facilities are also creating a stronger demand on small and medium size facilities with both existing national and new local companies. 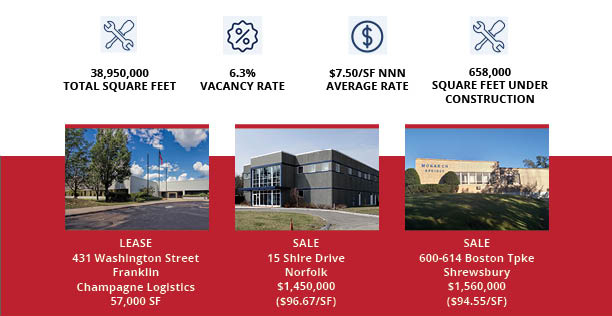 Six buildings of 30-180,000 SF are currently under agreement along the 495 South corridor.New Industrial offerings for sale are also in high demand with a recent 45,000 SF warehouse generating three above asking offers in less than two weeks. Given the low supply of product in this asset class expectations are for a continued strong demand for the balance of the year. Net absorption rate rises from 0.1% to 0.4% from Q1 to Q2 but absorption is still down 0.3% from Q2 2017. Rents continue to steadily increase since Q2 2014. 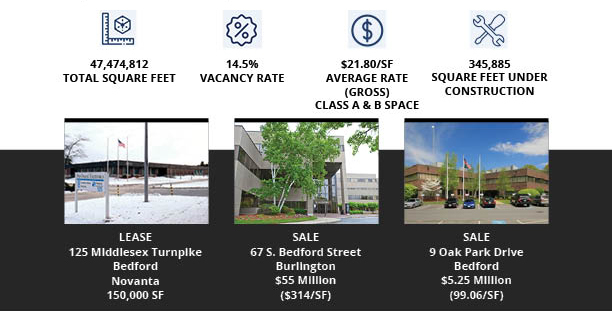 As most of I-495 struggles, over the past 5 years the Marlborough office vacancy has declined from 38.8% to 14.8%. After months of deliberation, Marlborough City Counselors pass new set of guidelines for housing development allowing them to move forward on some of the many proposed developments in the near future. Buildings without amenities will not be able to compete. Surprisingly, more companies are not taking advantage of the value proposition with rents averaging $12/SF lower than Rt 128. The Natick/Framingham market remains stable with vacancy rates hovering around 9.4 %. However, we have seen activity and absorption slow down considerably over the past year with more and more companies convinced that they need to be on or inside 128 to attract young talent. Many of Natick and Framingham’s office buildings are now approaching 40 years in age which stands in stark contrast to many of the newer offerings on 128. Exponent broke ground on their new facility in Natick and with the new larger office and lab space comes the promise of over 100 additional jobs in the science and engineering fields. Meanwhile the town also benefits from the commercial tax revenue that comes with a new 63,000 SF building. ABI-LAB plans to break ground on ABI-LAB2, a 65,000 SF state of the art lab facility on Strathmore Road in Natick. Designed for start up biotech companies between 800-1,500 SF, this “bio-incubator” building will offer shared lab and collaboration space and is slated to open in the Fall of 2019. 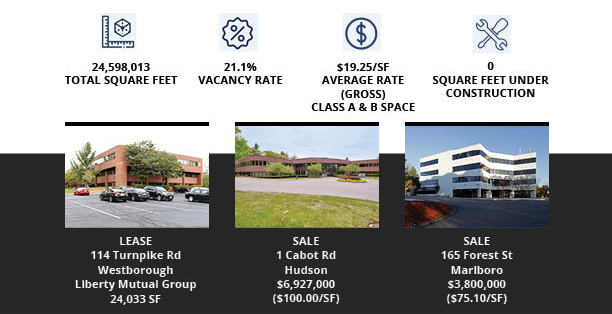 Over 320,00 SF of vacancy at 9/90 Corporate Center in Framingham with latest departure being 155,000 SF by CA Technologies. Also, there may be future availability at the Staples campus due to the sale of the company. Fortunately, there are a couple large users seriously considering these spaces. As many suburban companies consider opening a downtown location or moving their firm, here’s some insight to keep in mind when weighing the options of a Boston move. 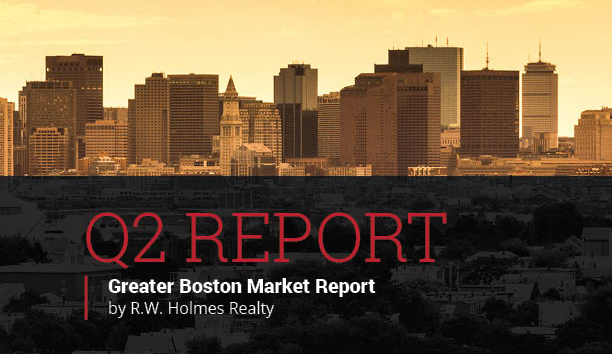 • Large Lease Activity: Back Bay is seeing some massive lease deals getting completed over the last quarter. Wayfair signed the second largest Boston deal of 2018 with a 395,000 SF lease at 500 Boylston/222 Berkeley. Draft Kings announced their plans to move their corporate headquarters to the same building within the next year. Co-working giant WeWork also announced plans for expansion in the Back Bay market at 501 Boylston St, bringing their total occupancy to just under 1 million SF in Boston proper. • Ease of Commute: In comparison to the Seaport, Back Bay provides an easier commute for both those using public transportation and those commuting into Boston from the suburbs. With direct commuter line access and several T lines servicing Back Bay, younger employees have a larger selection of where they can live that minimize commute time. • Low Vacancy: Back Bay has a vacancy rate around 5%, meaning the supply is limited and when space does come available, it goes exceptionally quick. In comparison to the suburbs, Back Bay averages at 8 months to bring a building to full occupancy, while Marlborough for example, averages around 14 months. This limited demand has lead to price averaging around $62/SF. • Heavily Developed Area: Unlike the Seaport, Back Bay has no open land to develop into a higher/better use. Therefore, as demand increases, there has not been a new supply of developments to compensate for the disparity between need and supply. We completed 35 transactions in Q2 including 31 signed leases and 4 closed sales. Notable transactions include the sale of 1 Cabot in Hudson for $6,927,000. 16 new leases totalling 62,000 SF were signed at Knowledge Park in Marlborough. Interest in this property has spiked due to significant upgrades and an overall rebranding of the office park. R.W. Holmes Realty is pleased to announce its new partnership with Real Capital Solutions (RCS) as the exclusive broker for 55 Old Bedford Road in Lincoln, Massachusetts, – known as Lincoln North. RCS became the newest owner of Lincoln North on June 1, 2018 with plans to revitalize the building with modern finishes and amenities to create a work-play atmosphere and community. Sean O’Riordan joined R.W. 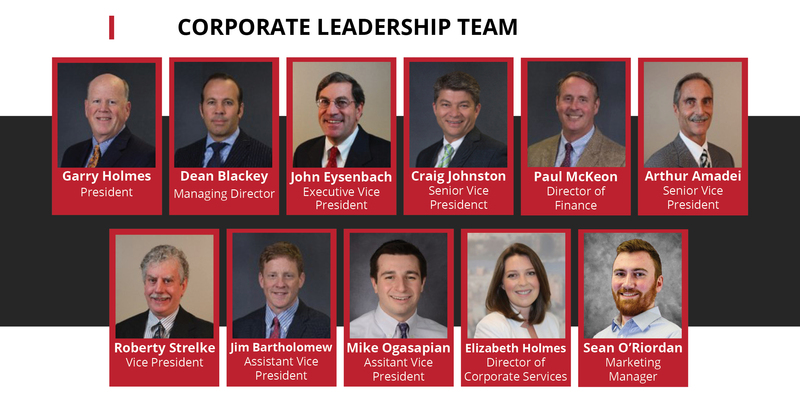 Holmes as Marketing Manager following a career in real estate marketing at Berkshire Hathaway. As Marketing Manager, Sean creates strategic and compelling marketing initiatives that set R.W. Holmes apart from our competition and help the brokerage team to ensure their clients’ success. Sean keeps R.W. Holmes up to date with emerging technology, trends, and opportunities so that we can stay as efficient and effective as possible in our marketing efforts.